Blokada 3.7 released 3 weeks ago. A big milestone for us, this is the last minor version in version 3, and we would like to thank you all your support on the social sites, forums, all your donations and contribution on GitHub. The ideas you share make this application better and better with every new release. One big change that 3.7 ships is the opt-out option for log sharing. We are aware how different ad blockers handle private data, and it is a reasonable concern. Between the fact that some ad blockers can block ads inside an HTTPS (encrypted) communication, some other may pass your data through third-party servers, and others (almost all) have some kind of reporting in the eventuality of application errors, of course there’s some sensibility around privacy, and it is perfectly valid. We, at Blokada believe in transparency, thus we would like to share technical aspects around it and clear up our position regarding privacy and personal data. A long time ago (specifically since mid 2017 with version 2), Blokada became an open source project. There were several factors involved in this decision, but we want to remark that, in part, it was to enable any user to know exactly what they are installing and what this ad blocker does. Blokada, as many other ad blockers, can’t be installed from the Play Store, it needs to be sideloaded, and of course, that always brings some concerns. A lot of users were asking for the code, and with some reasons to do it, after all, any ad blocker has to read your data to be able to block the ads in it. It’s a reasonable question mark over any sideloaded app, more with an app that is seeing your internet transactions. While “trust” is something not so easily achieved nowadays where we see leaks and unfair management of personal information, Blokada chose another approach: becoming open source. Given this fact, users don’t need to “trust” the app; anyone can see what Blokada does and does not. That was a first step for transparency. A second step is how in app private data is managed, and this leads us to logs and reports, where we had changes. To improve the app, have enough information to fix the bugs and malfunctions that were being reported by users, Blokada implemented two tools: an application log and a reporting tool that sends this log. These two things allow users to analyse and, if they choose so, send Blokada’s run log when an issue is found or the application crashed. Very important, that no log generated by default: it requires that the user grants external storage access permission for Blokada, and due to privacy concerns, our ad blocker doesn’t ask for it at installation. Version 3.7 brought you a new option, you can opt-out. In this case, after a crash the window won’t show up to send the report even if the user granted storage access permission. The log is accessible and viewable by anyone. It’s located on the phone and is accessible in the Downloads folder, in the Blokada sub-folder. It can be sent manually, or analysed using any text editor or debugging application. The only private data that can be seen in the log are the domains that have been blocked, since it is of course an application log and it records its activity. Also, a log is impossible to match to a device, account, phone number or any kind of personally identifiable identification. In other words: even if we have a log, we don’t know to who belongs unless you tell us. Basically, the data stored in the file comprises application actions for setting up the user selected filters, actions to maintain the VPN tunnel that allows the filtering to be done in phone, and the blocked requests that show Blokada is running accordingly to the user selected filters. 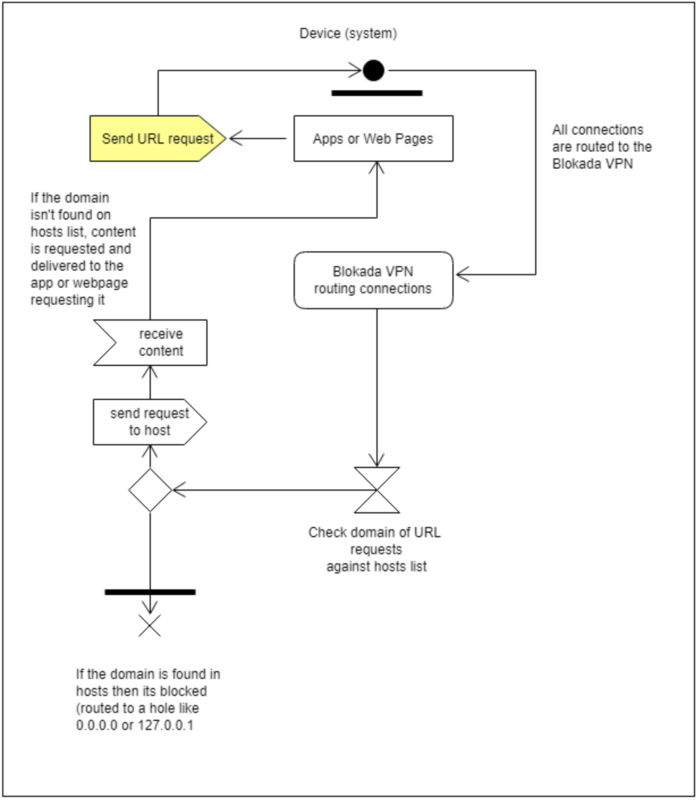 The log doesn’t even contain which app requested a blocked domain (even if that’s a requested feature). Which is turned on in 3.7, will be off in version 4. In the next major version, the application won’t ask to share the crash report by default. The Blokada team wanted to make clear for everyone our position over these questions. Users are not asked for “trust”. Instead, there are options and actions that allow all users to be sure of how data is handled. Talking about version 4, we have some news to share over the upcoming VPN service. It has been a long time request to include a VPN service, and it is understandable: while Blokada is a good ad blocker and it has a good reception, to be able to block ads without rooting a device it uses the VPN service API. Thus, the system believes there’s an active VPN connection. And since in android there can’t be two active VPNs at the same time, if a user needs to have a real VPN, Blokada needs to be disabled. Offering a stable and reliable VPN service isn’t an easy task. It requires hardware (servers, switches, etc) maintenance, network speed, uptime warranty, several factors that must be studied closely to ensure a decent service is provided. Because Blokada is a free application, the donations are ensuring the webserver is running and kept in hand, but can’t fund the required equipment of the VPN. We are considering to start a Kickstarter campaign, more news about it later. After a long time of review and a lot of discussions, the works are started to implement WireGuard into the application, however it won’t come out with the first iteration: to ensure we provide the best experience, we aim to have a stable application that can be used on all devices and if it is so, we will extend the list of features. Of course, first a small group will test the connection and network reliability before we open the service for the wide public. Stay tuned for v4 release and also for news over the VPN, we will keep you updated! See you later. This article is brought to you by Sebastian, one of Blokada Insiders, and is the first in a series of articles aiming to improve your understanding of ad blocking, privacy and malware protection, and related topics. In very simple words, how does Blokada work and what is that VPN? We all know that blocking ads is certainly something we all want. While some developers in fact rely on the revenue coming from displaying ads on their apps, the majority of ads we want to block are annoying, they increase the amount of traffic and simply ruin user experience, to put it straightforward (personal advice: if you use an app whose developers seems to really depend on ad revenue, you can whitelist that app on Blokada, and URL requests from that app won’t be filtered). There are several solutions to block ads available at the moment, but most of them are somewhat complex on the field of privacy data, others require special measures like rooting your phone, and others block ads on webpages but the rest of the system still displays ads. Nevertheless, Blokada requires none of this measures, and blocks not only webpages but also apps. Let’s see in short terms how Blokada does it. So, how does Blokada work? To put it simply, Blokada generates a Virtual Private Network, a VPN, on your phone, and through the use of that VPN it filters traffic against hosts lists that contain hosts that are known as ad hosts. Also, it provides alternate DNS, so eventually that traffic will be resolved with the use of those DNS. Basically two parts: first through the use a VPN all traffic is checked against a host list that contain ad delivery hosts; the second part is the host list itself, which is automatically updated within Blokada from known hosts list (like AdZHosts). A third component is the alternate DNS option provided by Blokada, but we’re not going to get into it now. To get things clear, DNS stands for “Domain Name Server” and/or Domain Name System, and while it’s much more complex than these few words, for the purpose of this short article we’re going to say that it is the system by which an URL is converted to an IP address, or, how your phone finally knows which IP is www.google.com. Blokada allows to use other DNS different from the system DNS, but by default the DNS used is the system DNS. Now, what is a VPN and how does the Blokada VPN affect the privacy of my data? A lot of people have asked about the privacy of their data, since Android will always tell you that there is an active VPN on your phone when Blokada is activated. In short words, a VPN is a method that allows, among many other things, for re-routing traffic. When Blokada is activated, traffic is routed locally on your phone and passed through the hosts lists. If there is a match between the URL that a webpage or an app tries to reach and an entry on the host list (the one that contain the ads hosts), then that connection is blocked. If there’s no match, then the data is retrieved from the host and delivered to your phone, be it a webpage or an app. Does the Blokada VPN mean that my data is passing through third party hands? No. The Blokada VPN is a local VPN and its reason is to route all the traffic through the hosts filters to know when a requested URL matches an ad host. As it was said before, if there’s an URL request to a host on the hosts lists, the request is blocked, so the ad isn’t even reaching the phone (this is where Blokada also helps in saving data, because it blocks the ad from the very request of it, not just displaying it). No data is passing through third party servers or hands or screens nor it is stored anywhere. So, for the peace of your mind, using Blokada and seeing that VPN android alert doesn’t mean your data is at risk. This method is the reason why Blokada works not only for webpages and inside a specific browser like any other browser extension, but also on any other app on your Android system that requests an URL. When we are trying to explain in simple words something that has several technical aspects, there always has to be a section with the correct terms, specially for readers with advanced knowledge. In this article we made a few compromises to keep it simple, but there are two important things. The first one: we used the concept of “URL request” to explain how ads are delivered, but Blokada in fact works at DNS level, meaning it filters not by URL but by domain. At DNS level, a domain is associated with an IP, and Blokada works at this level. These concepts -the DNS system- are a little bit technical since the DNS system involves “levels” among other things (the server that knows where to find .com domains knows where are the next layer of DNS, so it asks for a given .com domain to that DNS server, it’s a recursive query). For the purpose of this article we let it at “URL request”, but in reality Blokada works with domains, as in the DNS system (in the DNS system there’s no such concept as URL, but domain). We took the liberty to explain it with the use of the term URL since it is far more known than the concepts around the DNS system. The second one: there are two kind of hosts lists. The common ones, those used by Blokada, are composed by a domain and its associated IP address -and if there’s a match between the requested domain and an entry on the list, then the domain is blocked-. The other ones, commonly known as “cosmetic filtering” are used by some other ad blockers, and have another function. The difference is the following: when an ad is blocked, the webpage itself -or app itself- doesn’t know that the ad has been blocked, it simply doesn’t display it. Sometimes the consequence of this is a white space or some other layout issue, since the webpage or app had a space on the layout reserved for that ad. These other ad blockers sometimes use what is known as “cosmetic filtering”, meaning it filters content according to some other rules (like CSS styling, by detecting on the CSS where are ads located on the webpage) and work on the layout of the webpage. Blokada doesn’t work on this type of filtering, since Blokada works at domain level. This time we had 1039 responses, which is much more than before, although this survey was running for longer time than the previous ones. This was a multiple choice survey, so one participant could vote on more than one feature (and there was no maximum limit). In total, there was 2595 votes. Unsurprisingly Android was your top choice. I included it in the survey as a sanity check mostly ;). What is interesting though, is the fact that you rank Windows (23%), and Linux (16%) so high. This is a good sign for future expansion of Blokada, although for the foreseeable future I plan to put the focus on mobile platforms. From this perspective, it’s good to see that Android TV / Fire stick got a decent amount of votes (14%), even more than iOS (13%). The second question was meant to probe the popularity of iOS among you. This was an optional question, although 1010 participants responded to it (almost everyone). 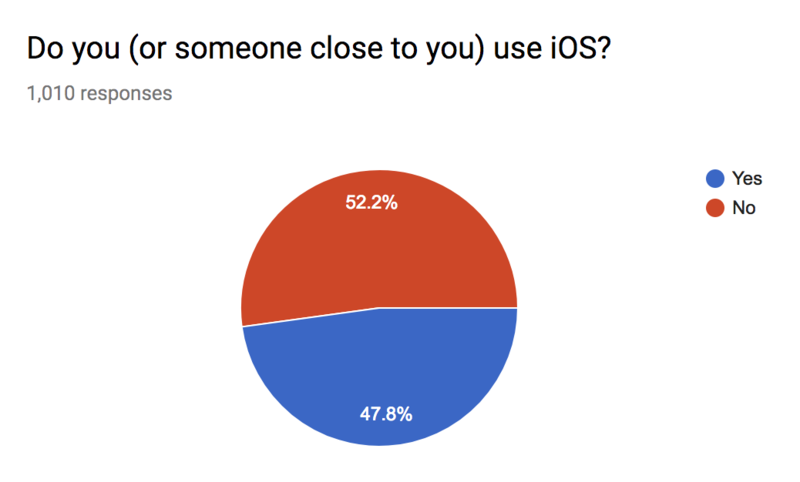 Almost half of you (48%) said to be using an iOS device or have someone close who is using it. This is great news for a potential future expansion of Blokada to iOS. Again, thank you for so active participation in another general voting of our community. The next survey is already online, and I encourage you to take part in it! This time we had 721 participants, which is great. This was a multiple choice survey, so one participant could vote on more than one feature (maximum 5). In total, there was 2317 votes. The most popular feature was HTTPS filtering (to block YouTube ads and encrypted ads) with over 20% of all votes. It’s worth noting, though, that probably the most popular feature (VPN), was not included in the survey, since it’s already planned. This result doesn’t surprise me much, since you ask about blocking YT ads a lot, but implementation wise, it’s hard to guarantee high effectiveness and low battery usage across devices. Nevertheless, the survey results tell me to keep this feature high on the priority list. Looking at the rest of highly popular feature requests yields some more surprising results. While the high demand for the Firewall feature (17%) is in line of what I expected, and confirms my priorities, it’s surprising to me to see the Auto activate / deactivate feature clocking over 10%. It’s welcome though, in particular since it’s way faster to implement than most of the other features. Other high contenders are: Better notifications (8%), Advanced DNS configuration (6%), and Data saver (6%). I’m quite happy those are high on your list, since they are high on mine too. Next in order are: Speed test (5%), Root non-VPN mode (5%), and Cloud backup (4%). Among those, first two are more popular than I would expect, while the cloud backup seems less important to you than I thought. The rest of the features apparently has a lower priority, so we won’t analyse them in detail just yet. Again, thank you for so active participation in another general voting of our community. For the last month I’ve been running a survey about the possibility of adding VPN service into Blokada. The idea is that introducing independently from the existing ad blocking and DNS changing functionality will allow to support the project development long term. The survey was designed to help me understand what you think about this idea and how would you like it to work. As usual, I could count on your participation. With 896 responses the survey turned out to be very useful for making decisions. Over 78% of you answered you’d use Blokada VPN, which I think is very promising result. Among those, 43% declared to only be interested in a free tier. It means that 44% of all voters is interested in a paid service, which is a very good sign for supporting the development of Blokada in the future. As to top features you’d like to see in Blokada VPN, first five are: high speed, strong encryption, servers in many locations around the world, no logs, and support for multiple platforms. It’s a bit surprising to see strong encryption so often requested, and it highlights the fact that Blokada users are quite tech savvy and concerned about privacy. Among the ones who said no, roughly 39% is happy with their current VPN provider, and 37% do not want to use any VPN anymore. Only 16% said to not trust Blokada enough to use its VPN service. The rest of responders provider more specific answers, mostly stating a lifetime subscription of existing VPN service, or a worry about Blokada becoming too bloated. The last one is an unnecessary worry though, since if the VPN service gets introduced in the future, it’ll be fully optional, and you’ll be able to use Blokada exactly as today, for free. Again, thank you for so active participation in another general voting of our community. I already prepared a new survey, and it’s available in the app. This time it’s simply about which features would you like to see implemented in Blokada the soonest. 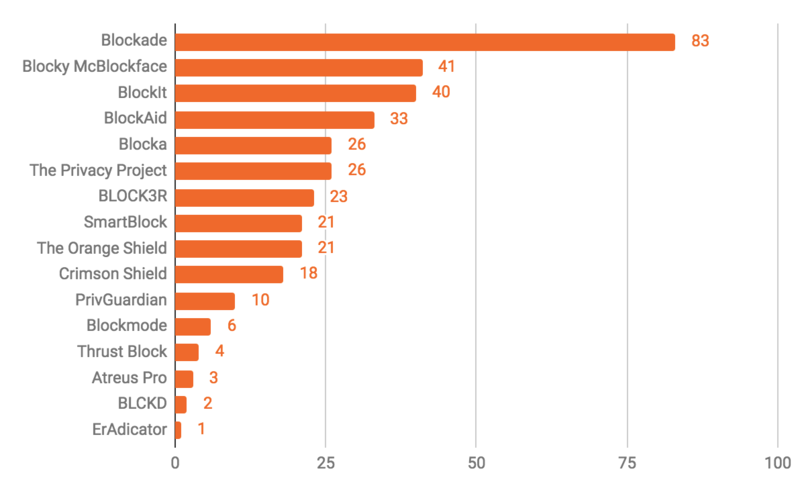 During the last year we’ve translated Blokada to 15+ languages, with more than 30 languages in total being worked on. This is amazing! In order to make the job easier for translators, I decided to change the translation platform to Crowdin. Migrating existing translations took me many hours, and not everything went smoothly to say the least, but I think you will agree it was worth it - the new platform is much better! You can read more about the new translation platform here. If you’ve contributed translations to Blokada before, I sent you an email about the new system. I invite you to try it out and let me know what you think. Also, we’re looking for people interested in managing translations - each language will have a person approving changes having a say on what goes into the app, and what doesn’t. We hope to increase the overall quality of translations this way. If you’re interested, please read about Blokada Insiders. 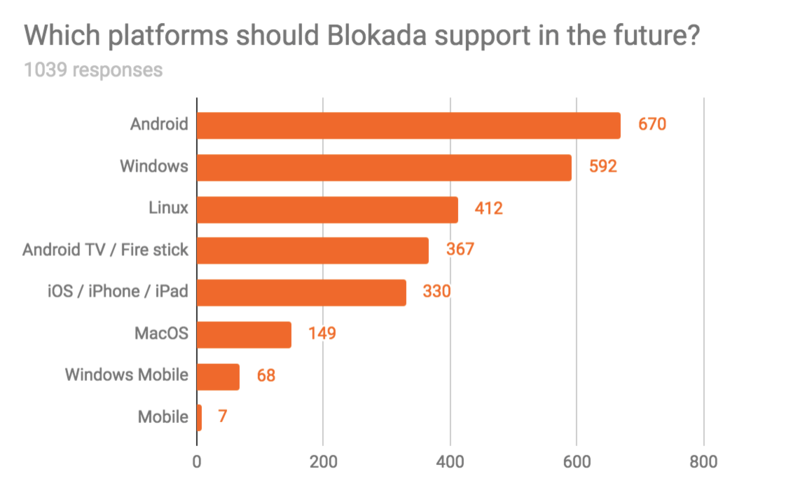 Since users seem to confuse the name Blokada very often, I decided to check what the community really thinks about the branding. Over the last 3 weeks we’ve been voting on alternative names for the project, and we got some cool suggestions. Here are the results. The first voting was designed to test if we want to change the name at all. Surprisingly, 89% of users (from 1286 votes) is happy with the name Blokada, or at least think we should not change it. This was a bit of surprise to me, but since rebranding is a significant amount of work and I would prefer not to do it, I was happy with the results ;). Users who voted to change the name was asked then to vote on one of the existing alternative suggestions, or propose their own. We got some really interesting suggestions, so just to exhaust the topic of branding I decided to run one more survey. The second survey was just focusing on those suggestions, to see which one of them is the best, in case we decide to rebrand after all in the future. We got 358 votes (this survey was running only a few days). The highest number of voters (23%) voted on Blockade. Two next most popular choices were Blocky McBlockface and BlockIt, both with roughly 11% of votes. So, thank you for so active participation in the first general voting of our community. I am very happy with the engagement and I think this is a very good way to decide about any matters important for the future of the project. In fact, we’ll be voting on introducing VPN functionality next.